Spring seems to be park project planning season. The park board approved concept plans for a playground at Schel Chelb Park last week. It also held a public hearing for a project to replace the dock at Hidden Cove Park and make small improvements to the uplands. Comments can be sent to Perry Barrett – perry@biparks.org – through May 28. The public dock on Port Madison is getting a little long in the tooth, to put it lightly. Popular with kayakers, dog walkers and bored teens, the dock has become rickety and rotted in places. The float also grounds out regularly at low tide, a no-no in the eyes of state permitting agencies. Yesterday, I mentioned that the Bainbridge park district’s Parkland Acquisition Committee is recommending that the first batch of levy funds go toward the purchase of a 31-acre property between Grand Forest Park’s west and east sections. Got the full story for you on that. Read it here. There’s nothing better than a map to show you just what this property is and what it will do for the park. Unfortunately, we couldn’t get a mapped location of the property before deadline. 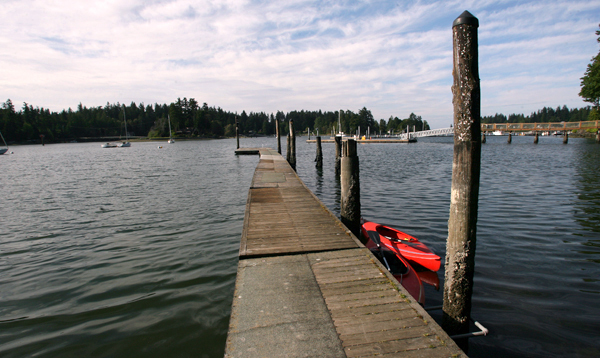 But, courtesy of the Bainbridge Island Land Trust, I can pop one into this here blog. Click down below to see it. It’s no mere “trail easement.” The property, referred to as the “Hill Top Tree Farm” by BILT, would create a wide bridge between the Grand Forest’s two largest sections. –The narrow gap between Hill Top and the east portion of the Grand Forest is actually a private dirt road. I’ve seen maybe one car on the road during dozens and dozens of visits there. Probably won’t disturb the flow of walking from one section to the other. –The “Heart of the Forest” property you see on the map is another Grand Forest link BILT is in the process of paying for. It will connect the west and north portions. Along with the Hill Top property, the Heart of the Forest will finally link up all of the Grand Forest sections. Friday’s arrest of a Bainbridge man for inappropriately touching a girl at the Bainbridge Island Aquatic Center is the second sexual misconduct incident at the public pool in just over a year. In April 2008, a 44-year-old Bainbridge man was accused of going into a bathroom near the center’s lobby with a 4-year-old girl. According to police, he then took off her bathing suit and observed her use the restroom. The girl’s mother, thinking she’d been in the facility too long, eventually entered and encountered the man, who “froze” and then left, police said. Though charged, the man’s sexual molestation case was thrown out due to lack of evidence. Officials from the Bainbridge park district, which runs the aquatic center, stressed that the pool is still a safe place for families. “I think we’re doing an excellent job protecting the public,” park district director Terry Lande said today. The center has several cameras in public areas and staff are trained to look for signs of sexual misconduct, he said. Lande was surprised that the alleged incidents connected to Friday’s arrest occurred out in the open and during a swimming class. Police say the incidents were recorded by the center’s security cameras. The park district immediately turned over the center’s security tapes and is working with police on the investigation, Lande said.